This really is the first and greatest of hills that linguists need to get over in order to talk about language to the public. I wouldn’t be surprised if linguists also have to get their undergrad students over this hill. So it’s good that Labov starts by surmounting this hill because the majority of the book is about African American Vernacular English (AAVE) and other non-standard varieties or dialects (linguistics pro-tip: non-standard does not mean substandard, it just means “not at all or not as highly privileged as the standard”). It’s also good that Labov is the one writing this book. He is a legend in the field of linguistics and his writing is clear and direct. 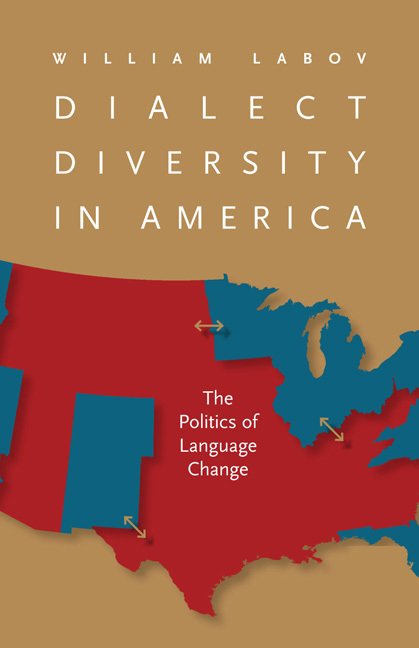 Cover of Dialect Diversity in America: The Politics of Language Change by William Labov. At the end of chapter 2, Labov makes an excellent point about our knowledge of language and what we do with it. So even though people understand what is being said – and why it is being said in a certain way – we still can’t get over criticizing others (especially women and minorities) for the language that they use. The (ING) variable is even more perfect because everyone – everyone? Yes, everyone – uses it in at least some cases. Chapter 5, “The Politics of African American English” discusses the divergence of Black and White English in America and how this is affecting African American literacy (the divergence is described in chapter 4). One of the most eye-opening passages in this book comes even before Labov talks about the Ebonics controversy (which Labov was right in the middle of). Labov writes about the ways that researchers have tried to influence the methods of teaching students who are native AAVE speakers. Labov then goes on to show how complaints about AAVE, or Ebonics, are usually thinly veiled admissions of racism. The dialect is used as a publicly acceptable way to disparage all black people; linguistic discrimination being the last allowable act of bigotry in high-minded liberal corridors. The examples he lists are vile and I don’t want to repeat them here, but in something any linguist could see coming a mile away, the people trying to satirize AAVE end up showing that they do not know how AAVE works. To these Labov only writes “Here again one can see the distance between public discussion and linguistic reality” and calls these hot takes “uninformed reaction[s] masquerading under the ‘helmet of wit’”. They are this but they are worse than that. People who stopped studying math in high school don’t make claims about how math should be taught. But people with high school English under their belt feel comfortable in pedant-splaining to others how language should be taught. Linguists who try to point out that all dialects are rule-governed and that no dialect is better than any other dialect and that non-standard does not mean substandard often receive a sneer from language peevers, “Then why did you write your book in Standard English? Hmmm?” It’s for the people who are not proficient in dialects other than Standard English. The dialect of Standard English is something people can easily acquire because there are more than enough resources out there to teach it. The materials on non-standard dialects are a fraction of what there is for the standard dialect. Books are written in a dialect, by the way. It just happens to be the slang of prigs. The last two chapters in Dialect Diversity in America take a look at the long history of the shifting dialects in the United States, specifically the Northern Cities Shift. Labov stretches his thesis across almost 200 years of history and ties it to the political switcheroo made by the Republican and Democratic parties. I’ll admit that these chapters lost me a bit, as I found some of the claims a bit more hard to grasp than in the previous chapters. I’m not doubting that Labov has done his research, I just think that the arguments in Chapters 7 and 8 didn’t seem as iron clad as the arguments in earlier chapters. I think, however, that people who are more into sociology, anthropology, politics and/or history than they are into linguistics might find this part of the book is their favorite. This book was, after all, written for non-linguists. If anything, it takes linguistics out of the research lab and applies it to the real world. I really enjoyed this book and I would recommend it to anyone with an interest in American dialects. Dialect Diversity in America: The Politics of Language Change (2012) is available from the University of Virginia press for $19.50. There is apparently an online collection of audio to accompany the book, but I did not review these (I got my copy of the book from the library and I can’t remember seeing a reference to the online audio. Maybe it’s in the 2014 edition). You can find a glowing review of Dialect Diversity in America by the distinguished linguist John Baugh here. (PDF for those behind the paywall). Next Next post: How do I like this language stuff?